The past few weekends, we've had friends over for a simple barbecue. Just burgers and dogs on the grill. Fast easy, lends itself to the host actually enjoying the company. But, we found ourselves building up the supply of uneaten smoky-flavored burgers. I put them in the freezer and finally decided to use them. Although I'm in the school of cooking meat raw in tomato sauce (rather than sauteeing it first), I had to make use of the cooked meat. Unfortunately, cooked burgers can be kind of tough after sitting around. I sauteed a few slivers of garlic (we go easy on the garlic in my home), some chopped onion, my new favorite canned tomatoes, 6 in 1 and tossed in those burgers just cut in half and let it barely simmer for a few hours. I then mashed up the burgers with a potato masher and voila, meat sauce with a subtle smoky hint to it. 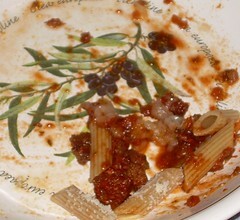 We ate it with whole wheat pasta for a robust and flavorful meal. This is what remained of Frankie's portion (we helped a bit).